snowdeal.org > ex machina: the case of the curious bell pepper. the case of the curious bell pepper. perhaps i'm a dolt but i don't think i've ever seen a green bell pepper growing inside a red bell pepper. perhaps i've discovered a culinary oddity worthy of selling on ebay? i mean, if the virgin mary grilled cheese went for $28,000 surely this must be worth a few bucks. kris thought it might have something to do with it's diminutive size ( late cultivar from our garden ), but i don't think small peppers typically have even smaller, less ripe peppers growing in them. but maybe i don't know anything about peppers ( shocking, i know ). update: i guess it's more normal than i thought, see "My bell pepper is pregnant with an alien". best comment, "Please, don't beleive these people who say this is normal. They are unfortunate victims of the alien brain pod. 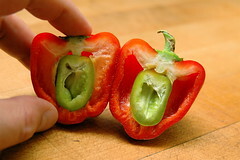 These alien pods are placed inside seemingly harmless bell peppers so that it can implant itself in your brain."